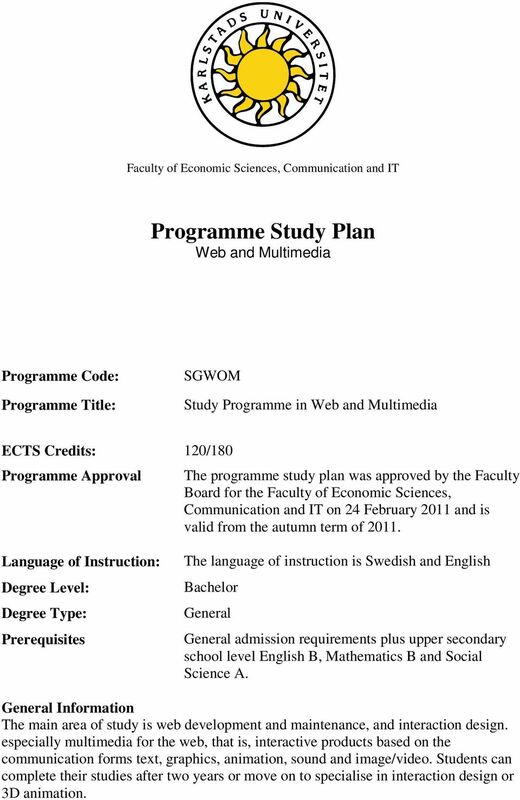 1 Faculty of Economic Sciences, Communication and IT Programme Study Plan Web and Multimedia Programme Code: Programme Title: SGWOM Study Programme in Web and Multimedia ECTS Credits: 120/180 Programme Approval The programme study plan was approved by the Faculty Board for the Faculty of Economic Sciences, Communication and IT on 24 February 2011 and is valid from the autumn term of Language of Instruction: Degree Level: Degree Type: Prerequisites The language of instruction is Swedish and English Bachelor General General admission requirements plus upper secondary school level English B, Mathematics B and Social Science A. General Information The main area of study is web development and maintenance, and interaction design. especially multimedia for the web, that is, interactive products based on the communication forms text, graphics, animation, sound and image/video. Students can complete their studies after two years or move on to specialise in interaction design or 3D animation. 2 2(6) Aims and Objectives For a University Diploma, students should be able to: Knowledge and understanding explain the meaning of different informations systems and their structure, organisation and means of control, as well as of individual and group behaviours in the systems, and demonstrate knowledge of systems development methodology, computer technology, programming language, database design, implementation tools, and projects, as well as an understanding of how to apply this knowledge in solving problems. Skills and abilities demonstrate ability to identify, structure, describe and present problems, as well as to analyse and assess alternative solutions and their consequences in terms of technical, human, and orgnisational perspectives, demonstrate ability to work professionally with web design in organisations and companies, demonstrate ability to use image, text and sound appropriately in different types of multimedia products, especially for web based products. Judgement and approach demonstrate understanding of the need to cooperate across disciplines to integrate knowledge of technology, organisation and people, demonstrate ability to follow and analyse the development trends in the web design area regarding, for instance, IT systems with open source code, component-based IT architecture and tools for web production. For a Degree of Bachelor, students should, in addition to the University Diploma requirements, be able to: Knowledge and understanding Interaction design: explain the meaning of the design concept as used in the areas multimedia and human-computer interaction, and demonstrate understanding of the importance of interdisciplinary approaches in creating web services and other interactive systems designed to aid and support people at work and at home. 3D animation demonstrate understanding of the principles and theories of 3D modelling, animation, texturing and lighting, demonstrate understanding of the working model for 3D production. Skills and abilities Interaction design: demonstrate ability to assess web and multimedia products based on usability, demonstrate ability to apply user-centred interaction design methods including different types of prototyping, demonstrate ability to work professionally with systems design in corporations and organisations from a user and client centred perspective. 3 3(6) 3D animation demonstrate ability to apply methods for 3D modelling, animation, texturing and lighting, demonstrate ability to participate in the planning of a production including role descriptions for production team members and stage setting. Judgement and approach Interaction design: demonstrate ability to act professionally in the role of interaction designer, making, for instance, ethical judgements in designing user-centred development activities, and demonstrate ability to assess and argue for the needs of clients and users of websites and to balance needs against budget. 3D animation demonstrate ability to act professionally in the role of 3D designer, making, for instance, ethical and budgetary judgements in 3D production. Programme Structure The programme comprises 120 or 180 ECTS cr. which means two or three years fulltime study. In the first term students study basic courses in information systems and in the second term three web and multimedia courses and two courses in computer science. In the third term, there is a web development course which includes the components web development, database design, object-oriented modelling and programming. In the fourth term, students who choose to conclude their training after two years study elective courses of 22.5 ECTS cr and carry out a 7.5 ECTS cr independent project required for a university diploma. Others continue towards a Bachelor s degree and study elective courses for the whole fourth term, In the latter case, students usually take a full term of 3D animation studies in preparation for the fifth term 3D animation specialisation. All students also have the opportunity to study abroad in the fourth term, with supervision offered for the diploma project at a distance. In the fifth term students specialise in interaction design or 3D animation, and conclude the programme with two elective courses (15 ECTS cr) and a degree project (15 ECTS cr) in their specialisation. Bachelor degree students can continue towards a one-year Master (60 ECTS cr.) or a two-year Master (120 ECTS cr.) degree. Main field of study Information Systems is the major subject of both the University Diploma and the Degree of Bachelor. 4 4(6) Programme Curriculum Mandatory courses in terms 1-3: Term 1 Prototyping: Testing and Communicating Design Concepts, 7.5 ECTS cr. Introduction to the development of user-friendly computer systems. Focus on the user-system interaction. Enterprise and IT, 7.5 ECTS cr. Methods and models for developing information systems. Change analysis is applied to study how an organisation operates and user demands on future IT systems. Acquisition of Information Systems, 7.5 ECTS cr. Analysis and design of information systems with requirement specifications as support in the acquisition process. Different description techniques and forms of modelling to draw up a requirement specification. 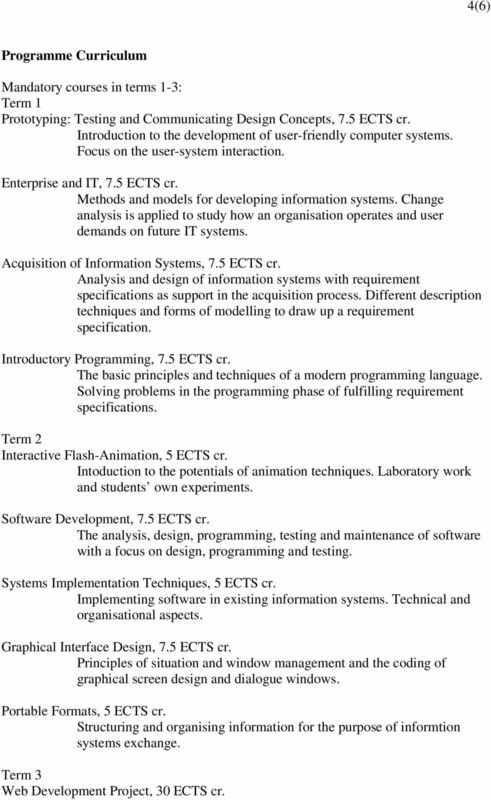 Introductory Programming, 7.5 ECTS cr. The basic principles and techniques of a modern programming language. Solving problems in the programming phase of fulfilling requirement specifications. Term 2 Interactive Flash-Animation, 5 ECTS cr. Intoduction to the potentials of animation techniques. Laboratory work and students own experiments. Software Development, 7.5 ECTS cr. The analysis, design, programming, testing and maintenance of software with a focus on design, programming and testing. Systems Implementation Techniques, 5 ECTS cr. Implementing software in existing information systems. Technical and organisational aspects. Graphical Interface Design, 7.5 ECTS cr. Principles of situation and window management and the coding of graphical screen design and dialogue windows. Portable Formats, 5 ECTS cr. Structuring and organising information for the purpose of informtion systems exchange. Term 3 Web Development Project, 30 ECTS cr. 5 5(6) Project form studies, including database design, web development (client script, web server, 3D solutions). object-oriented modelling and software development. 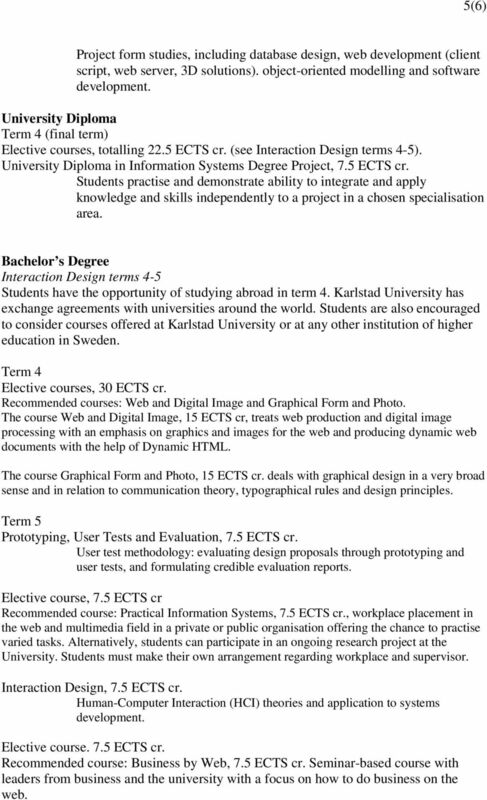 University Diploma Term 4 (final term) Elective courses, totalling 22.5 ECTS cr. (see Interaction Design terms 4-5). 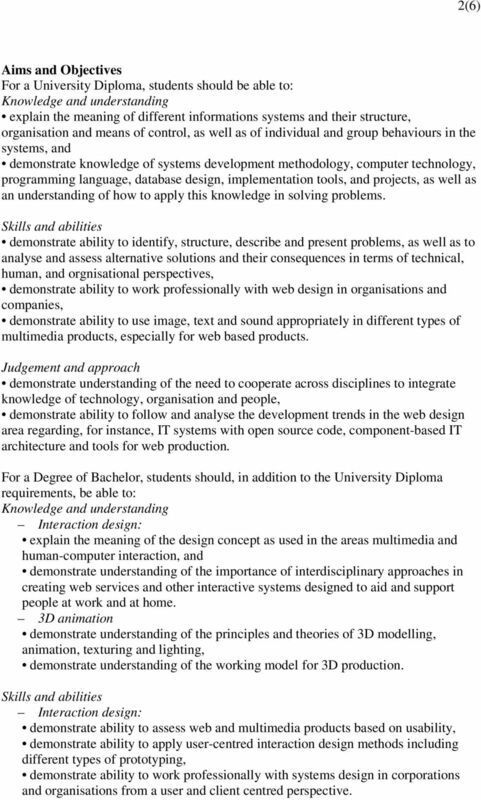 University Diploma in Information Systems Degree Project, 7.5 ECTS cr. Students practise and demonstrate ability to integrate and apply knowledge and skills independently to a project in a chosen specialisation area. 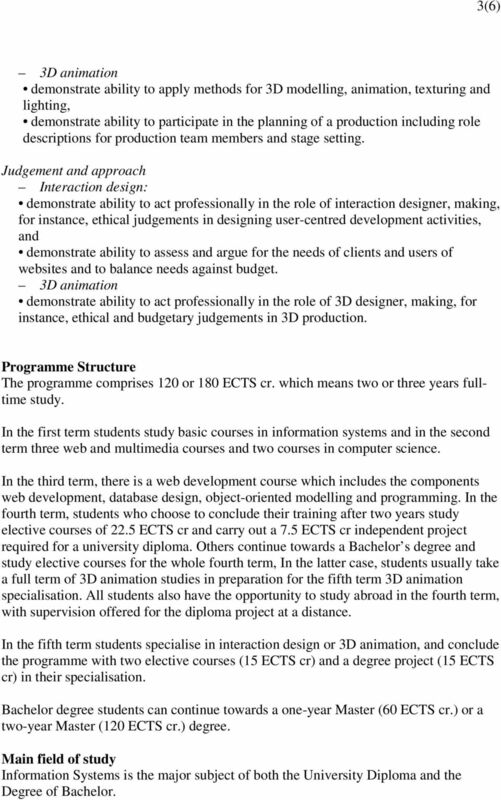 Bachelor s Degree Interaction Design terms 4-5 Students have the opportunity of studying abroad in term 4. Karlstad University has exchange agreements with universities around the world. Students are also encouraged to consider courses offered at Karlstad University or at any other institution of higher education in Sweden. Term 4 Elective courses, 30 ECTS cr. Recommended courses: Web and Digital Image and Graphical Form and Photo. The course Web and Digital Image, 15 ECTS cr, treats web production and digital image processing with an emphasis on graphics and images for the web and producing dynamic web documents with the help of Dynamic HTML. The course Graphical Form and Photo, 15 ECTS cr. deals with graphical design in a very broad sense and in relation to communication theory, typographical rules and design principles. Term 5 Prototyping, User Tests and Evaluation, 7.5 ECTS cr. User test methodology: evaluating design proposals through prototyping and user tests, and formulating credible evaluation reports. Elective course, 7.5 ECTS cr Recommended course: Practical Information Systems, 7.5 ECTS cr., workplace placement in the web and multimedia field in a private or public organisation offering the chance to practise varied tasks. Alternatively, students can participate in an ongoing research project at the University. Students must make their own arrangement regarding workplace and supervisor. Interaction Design, 7.5 ECTS cr. Human-Computer Interaction (HCI) theories and application to systems development. Elective course. 7.5 ECTS cr. Recommended course: Business by Web, 7.5 ECTS cr. Seminar-based course with leaders from business and the university with a focus on how to do business on the web. 6 6(6) 3D Animation terms 4-5 Term 4: 3D-Animation: Theory, Techniques and Production I, 30 ECTS cr. There are four components: Introduction to 3D Animation and 3D Modelling, Animation, Texturing and Lighting, and Production. Term 5: 3D-Animation: Theory, Techniques and Production II, 30 ECTS cr. There are three components: Modelling, Texturing and Lighting specialisation, 3D-Animation specialisation and 3D-Visualisation project. Mandatory courses for both specialisations term 6 Term 6 Elective courses, 15 ECTS cr. Recommended courses: Systems Integration and Future Web Standards and Mobile Multimedia. (also skills. 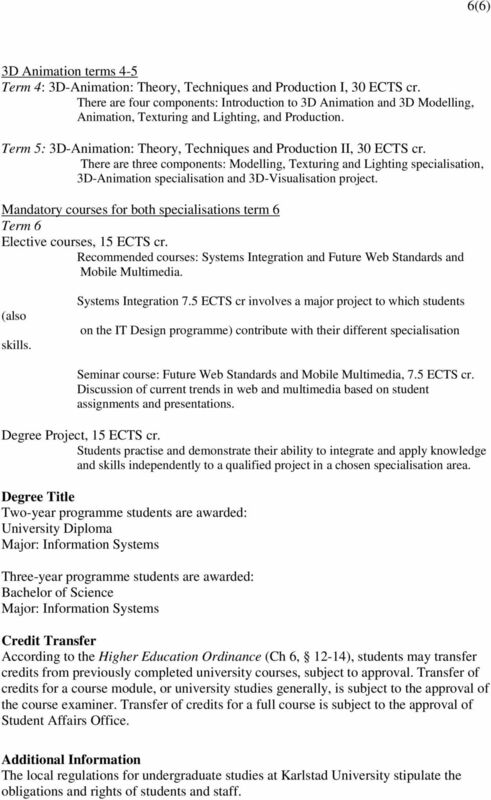 Systems Integration 7.5 ECTS cr involves a major project to which students on the IT Design programme) contribute with their different specialisation Seminar course: Future Web Standards and Mobile Multimedia, 7.5 ECTS cr. Discussion of current trends in web and multimedia based on student assignments and presentations. Degree Project, 15 ECTS cr. Students practise and demonstrate their ability to integrate and apply knowledge and skills independently to a qualified project in a chosen specialisation area. Degree Title Two-year programme students are awarded: University Diploma Major: Information Systems Three-year programme students are awarded: Bachelor of Science Major: Information Systems Credit Transfer According to the Higher Education Ordinance (Ch 6, 12-14), students may transfer credits from previously completed university courses, subject to approval. Transfer of credits for a course module, or university studies generally, is subject to the approval of the course examiner. Transfer of credits for a full course is subject to the approval of Student Affairs Office. Additional Information The local regulations for undergraduate studies at Karlstad University stipulate the obligations and rights of students and staff. Translation of Subject Curriculum (Study Plan) for Third-cycle (PhD) Education. Chemistry with specialization in Chemical Physics.